We want to thank all of our wonderful brides and grooms for giving us the honor of being their wedding photographer. Every wedding I have ever done I consider a true honor being their wedding photographer. Documenting their special day with photos. I get the behind the scenes look at how one of the most important days of their lives unfolds. We get capture the candid moments with the guests and family. Find out about your Atlanta Wedding Photographer by reading reviews from customers and brides! 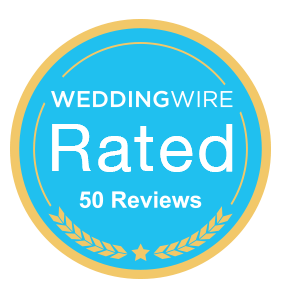 The Atlanta Wedding Photographers at Atlanta Artistic Weddings receive two awards from Weddingwire! I hope when they look back on their wedding day that they can look at the photos and memories come flooding back. The toast that your best friend made and you both cried afterward then hugged each other. The family that came all across the country to celebrate the love that you had found. The dad welcoming the guests and tearing up sharing the stories of how his little girl has grown up. The first dance where the world disappeared around you. The wedding exit where everyone waved and wished you well as you started your new journey together through life. You did not know what it the future would bring but you knew that you would do it together. That is why it is such an honor to be a Atlanta wedding photographer. We are just a small part of your wedding day but we hope we can give you photos that you will cherish forever! Thank you so much for visiting this wedding photographer's blog. I hope you keep coming back and leaving me notes. I would love to hear from you.